Trying to quit smoking is not an easy feat there are withdrawal symptoms after quitting smoking. In fact, the challenge can be almost overwhelming for some people. The changes you experience in your body when you give up smoking can be difficult to handle. 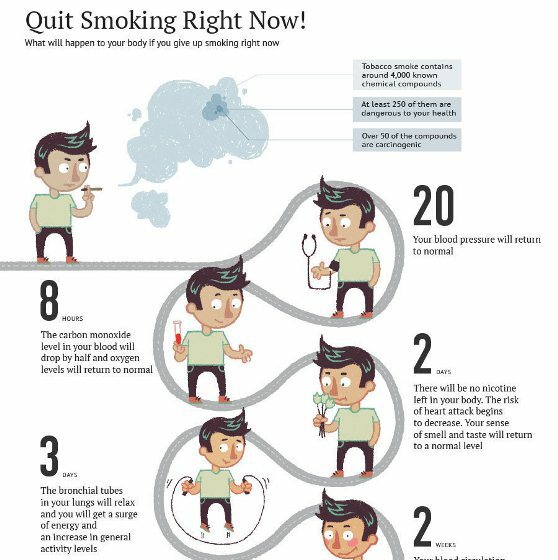 That’s why it’s important to understand what happens to your body when you quit smoking. What Are Withdrawal Symptoms When Quitting Smoking? The withdrawal symptoms, that almost every smoker goes through when quitting, can be very unpleasant. This is the reason why so many people can’t resist having another cigarette. They may attempt to quit over and over but be unable to stay smoke-free, due to the painful withdrawal side effects. However, if you understand what happens to your body when you quit smoking and you know what to expect in the process, this information can help you to stay on course. It’s easier to deal with nasty withdrawal symptoms when you realize they won’t last long. You probably know that nicotine is a powerful and addictive drug. As with any other addictive drug, when you stop taking it you will inevitably go through withdrawal. Your body has to adjust to the absence of nicotine, which takes a little time and results in physical and mental side effects. But soon enough, if you can avoid smoking, your body will lose its dependency on nicotine and return to a healthier, non-addicted state. These are just some of the events that can occur when you quit smoking. The withdrawal symptoms after quitting smoking may sound rather dreadful, but keep in mind that they last just a short time, often no more than a couple of days. On the bright side, your health will begin to improve right away, with positive changes taking place only 20 minutes after you smoke your last cigarette. The longer you can avoid smoking, the more health benefits you will experience. You might not be looking forward to going through withdrawal, but try to focus on all the positive things you will gain when you quit smoking for good. The effort of getting through the withdrawal symptoms after quitting smoking truly is worthwhile.